Rob and I had a wonderful weekend with my folks. They are the kind of people anyone would be grateful to know. Generous, thoughtful, sincere and down right funny. Most of our visits revolve around food. Which we love. 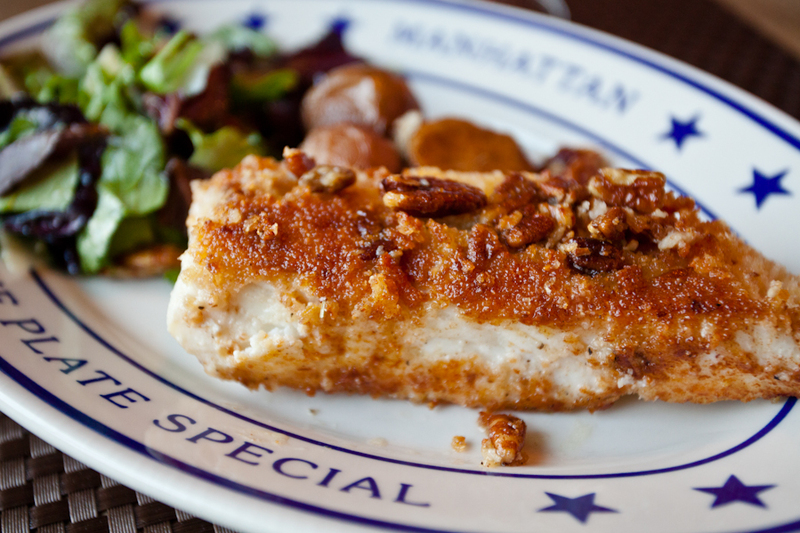 Often we hit up some of our favorite restaurants but this weekend my mom took me under her wings and taught me how to make her famous, pecan crusted halibut and with just a bit of prep, this fish is restaurant worthy. The crust: pecans, panko, lemon rind & parmesan cheese. Everything cooks better with butter. My mom was a bit more generous with the butter than I would have been, but I must confess, it was perfect. 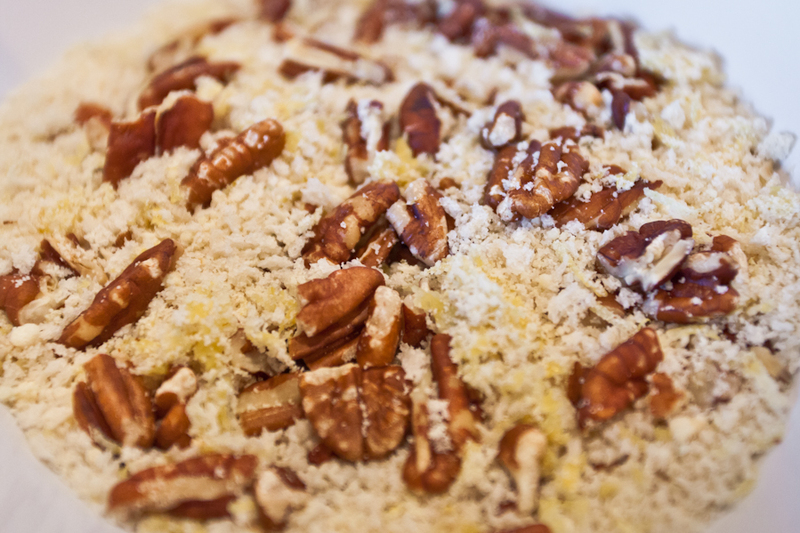 Combine the panko, cheese, lemon zest and pecans. Set aside in a shallow dish. Beat the egg and place in a shallow dish. 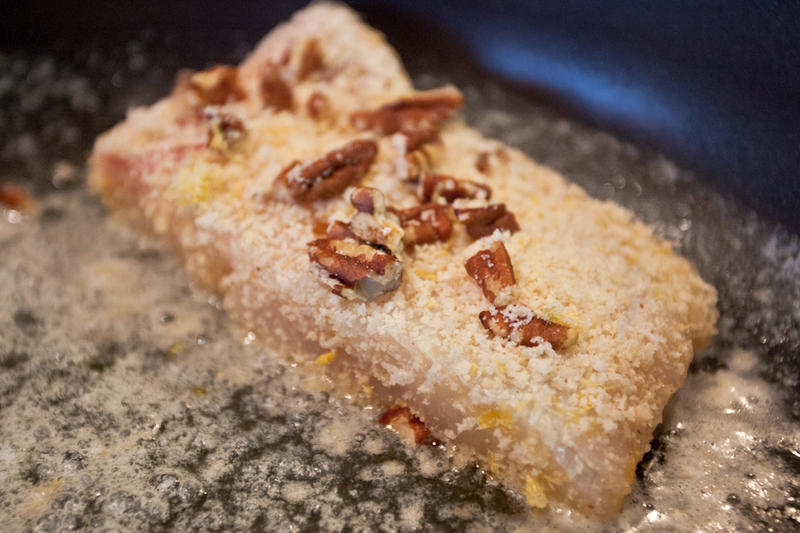 Dry the halibut off and dredge through the egg then coat well with the pecan mixture. Cook on medium heat in butter, turning once. About 6 minutes on each side. A few side notes: I was surprised by the patience it took to cook the fish. The key is to keep your pan from becoming too hot. You want to allow each side of the fish to come to a nice golden brown, turning only once so that the fish does not fall apart. I should mention, the one piece I tried to do without my moms help was the only piece that ended up in three pieces rather than one nice filet. While this dish is not difficult to make, it does take a little finesse. Or perhaps, just patience. In any case, the outcome is mouth watering so don’t sweat it if the presentation is a little less than perfect. We served our halibut with a nice light salad and a few small potatoes. So excited to find your blog! This halibut sounds awesome and I can hardly wait to try it. I’m always looking for new and delicious recipes. I have become a groupie! I have made every one of these recipes and CANNOT wait for your next post! 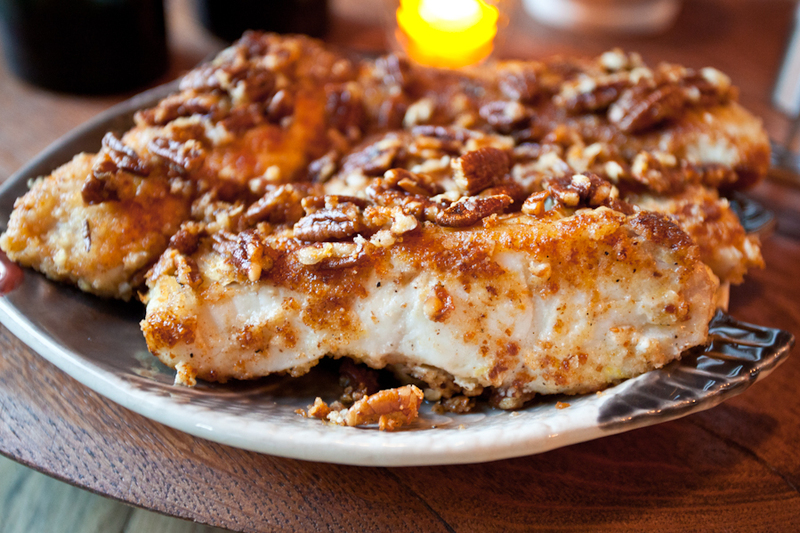 The pecan crusted halibut? Come on….so amazing. Rob’s salad is a big hit in my house. Ron and I start EVERYDAY with a smoothie (I think he’s turning green). The WAFFLES? So refreshing! Goodbye Aunt Jemima and Bisquick boxes! I’m standing by for more….